When deaths and disorder plague a new city-controlling computer system, the creator of the technology works frantically to save his life’s work and prevent a catastrophic failure of the system. In the middle of this technological race, Everyday Computers, a hardware company, and Madison Software Labs, a software company, created a system that would not only interface and unite all the apps and various technologies we use in our lives, but would use Artificial Intelligence to control an entire city. Even with the promise of massive cost savings, improved crime fighting, medical implants to extend lives, and the vision of the elimination of traffic jams, many cities were hesitant of the new technology due to the complexity of the system and the massive initial costs. 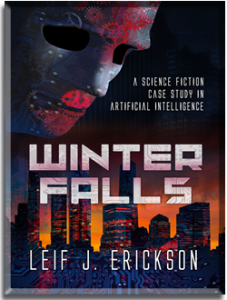 One city, Winter Falls, with an ambitious mayor who has sights set on higher offices, decided to implement the city-controlling technology. Invented by a quiet and timid man, Dr. Jack Hall, the system comes online and, by all outward metrics, is an instant success. Internally, worry develops when one of the workers on the system mysteriously dies. Fingers are pointed and threats are made, but as local detectives start the investigation, a vast conspiracy is discovered that not only threatens to unravel the system, but the people working with it as well. As the conspiracy deepens, and more people murdered, the detectives are faced with only unanswered questions and dead ends. A vast network of lies and deceit has been cast to derail the investigation and prevent the people who’ve committed the crimes from facing justice. With people blaming the system and arguing for it to be taken offline and undergo more testing, the detectives soon learn that, while artificial intelligence needs to be closely monitored, the people operating that technology are the ones to lookout for.